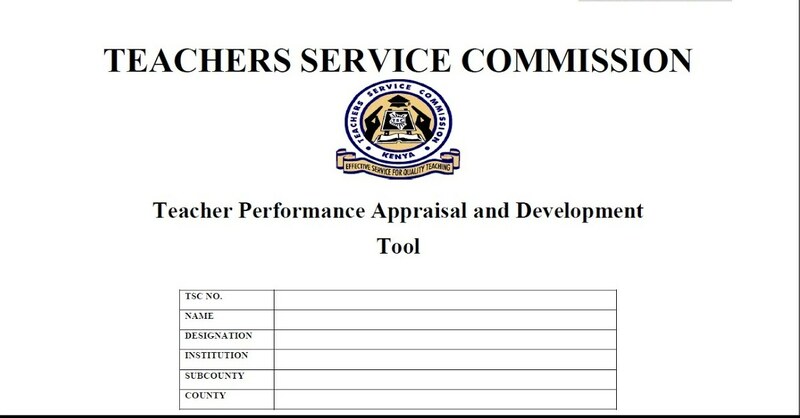 TSC Appraisal Form: Teachers in kenya are nowadays required to fill out a teacher appraisal and development tool. below, we have listed the downloadable TSC TPAD Toor for teachers 2018. Currently, promotion of teachers is based on existence of funded vacancies in the approved establishment, minimum qualifications per grade and relevant Teacher Professional Development (TPD) modules. Others are relevant experience and satisfactory performance. The guidelines effectively replace the following: scheme of service for non-graduate teachers, scheme of service for graduate teachers and scheme of service for technical teachers and lecturers. The guidelines are applicable to teachers serving in the following public institutions: primary schools, secondary schools, Technical and Vocational Education and Training (TVET) institutions, Teacher Training Colleges (TTCs), Kenya Institute of Special Education, (KISE), Centre for Mathematics, Science and Technology Education in Africa (CEMASTEA); and special needs institutions. A primary school teacher will be required to have C (plain) in KCSE exam and Primary Teacher Education (PTE) Certificate while the entry grades for the visually and hearing impaired for PTE will be a C- (minus). Secondary school teachers is required to have KCSE grade C+ (plus) and a Diploma in Education or KCSE C+ (plus) and a Bachelor’s degree in Education or a Postgraduate Diploma in Education. For technical colleges, lecturers are required to have KCSE C+ (plus) and a diploma in a relevant technical subject plus a Diploma in Technical Education, KCSE C- (minus), certificate, diploma and Bachelor’s degree in a relevant subject area plus a Diploma in Technical Education. For special needs education, the teacher is required to have KCSE C+ (plus) and Diploma in Special Needs Education or KCSE C+ (plus) and a Bachelor’s degree in Special Needs Education. The commission has also established a new grading structure for the teaching service, which has elongated the job scales from 10 to 11 grades based on the relative worth of each job. The grades established for each category of institutions are: eight grades for primary school teachers, 10 grades for secondary school teachers, six grades for teachers at Centre for Mathematics, Science Technology Education in Africa (CEMASTEA), eight grades for teachers in TVET institutions, seven grades for teachers in TTCs and eight grades for teachers in KISE.